Roofing experts are constantly applying new and improved industry trends to their roofing projects to give residential customers a better experience. What’s trending in the roofing industry often depends on geographical location, specifically due to the way that climate affects roofing needs. As a top professional residential roofing expert in North Carolina, our Pickard Roofing team has pulled together a list of the top residential roofing trends in the Tar Heel State for 2019. Shingles are a popular choice among North Carolina homeowners for their residential roofs, and for good reason. Shingles come in a variety of styles and price points, making them a cost-effective solution that can also personalize a home’s exterior. Customers are finding that their choice in shingles can add to the architectural elements of their home. Based on price points and value, most customers are continuing to select the architectural shingle. However, for those wanting an added element to the design of their home – we are seeing selections such as the CertainTeed Belmont and Grand Manor series which adds an additional slate look and feel design element. An example of CertainTeed Grand Manor series shingles. The shingle color, ‘Gatehouse Slate’ adds a slate look and feel to the home. When adding metal to your roof, you are creating a contrast that works well with brick, wood, or vinyl exteriors. We are seeing more customers add architectural interest and contrast to their homes by incorporating different metal elements to their home exterior. Some customers even opt to have an asphalt shingle roof, with metal accents in exterior doorways, porches, and walkways. With metal roofing, you can enjoy aesthetics, durability, and longevity. Even in climates with extreme weather conditions, metal roofing materials maintain their condition and gorgeous hues. Moss, mold, and mildew do not readily grow on metal, making these roofs less maintenance intensive for homes in humid climates, like North Carolina. Metal roof applications for homes continues to grow in both new home building and re-roofing. Our team has completed many projects on coastal homes using white metal applications, mainly due to the high reflective value. Dark-hued standing seam metal roofing is another popular choice and helps create a modern farmhouse exterior aesthetic. 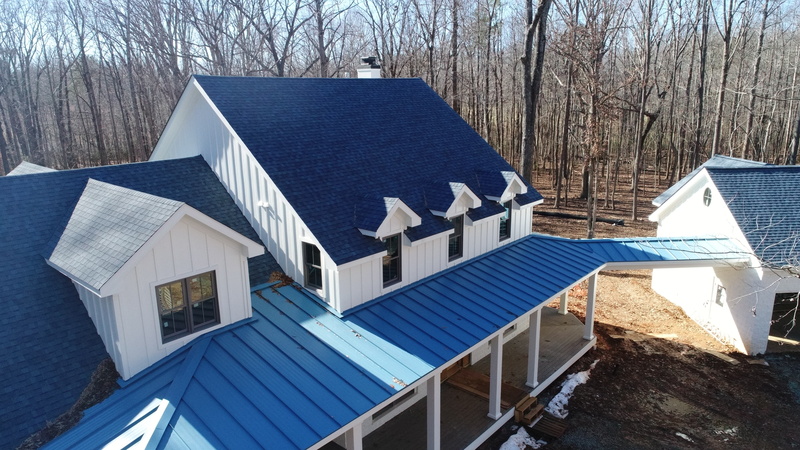 Standing seam metal roofing creates a modern farmhouse exterior on this roof done by our team in Durham, North Carolina. Flat roof and low slope roofing are becoming a popular choice among North Carolina roofing customers. Many flat roof customers seek green roof gardens, which add a unique, natural aesthetic to their home. For low slope roofing projects, we continue to see TPO applications. Most applications are white or grey because of their solar reflective value and energy savings. For those with flat outdoor decks, balconies, or walkways, a popular choice among North Carolina homeowners is Dec-Tec type applications. Dec-Tec is a PVC application that adds texture and durability to flat areas with high pedestrian traffic. A Dec-Tec PVC application by our Pickard team on a coastal deck in North Carolina. The right roof can bring your entire home exterior aesthetic together. If you are in North Carolina, you can trust Pickard Roofing to design your new roof using our expert craftsmanship, industry knowledge, and superior customer service.